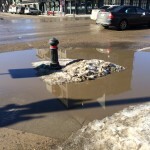 After last week’s crazy-cold weather, spring has definitely arrived in Saskatoon. Temperatures are hovering just around the freezing point, which has allowed us stoic prairie folk to shed a couple of layers: on the downside, we’re now facing potholes and puddles. I’m sure winter has at least one parting storm up its sleeve for us this year, but I think we’ll be firing up the grills, hitting the patios, and soaking up some sun not long from now. As promised, I continued on the Who’s Not Here theme with a soapbox post asking if you’re asking the right questions. Last Wednesday, I gave a brief presentation about Developmental Evaluation at the Social Innovation YXE March Meetup. There seems to be a lot of interest in this topic, which got me thinking that I should update my Developmental Evaluation resource page! As mentioned in the previous instalment, this week marks the launch of the Poverty Costs campaign. There’s a Poverty 101 session this Thursday night and a benefit concert at Amigo’s Saturday! Also listed last week is the Brain Blast educational event, taking place on Sunday March 16 between 12-3 at City Hospital. Sounds like a great opportunity to see how much I forgot remember from Psych 100 all those years ago. In case your schedule wasn’t full enough, the University of Saskatchewan is hosting Aboriginal Achievement Week to celebrate Aboriginal achievement, reflect on traditions and ceremonies, and connect with the community. Tonight I’m hoping to catch Buffy Sainte-Marie’s presentation at the Broadway Theatre! More happenings at the Broadway: Saskatchewan Deaf and Hard of Hearing Services Inc is hosting a screening of”Beethoven Lives Upstairs” on Friday March 14 starting at 7pm, with an interactive discussion following the film. Saskatchewan Co-operative Association is hosting a webinar next week (March 19th) with Vanessa Hammond on the topic of co-operative governance. Speaking of webinars, if you’re interested in Scaling Impact, Collective Impact, or Social Enterprise, Innoweave has free webinars next week for you! 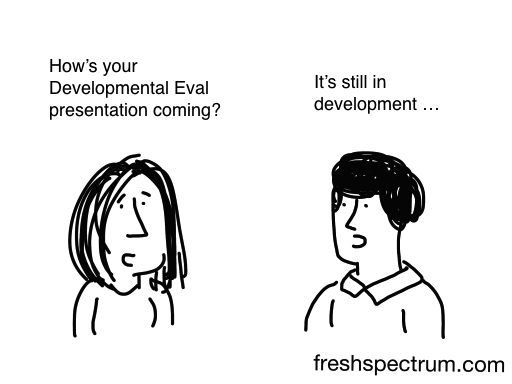 Chris Lysy has been using cartoons to illustrate evaluation principles for some time (for example, see his take on logic models), and now he’s sharing some templates for free so we can all unleash our inner cartoonist. Over at the Toronto Star, Mitchell Kutney argues that we shouldn’t hold non-profit CEOs to a different standard on salary than their for-profit counterparts – what do you think? After learning about the Annual Melee of Kindness (AMOK) from the Community Psychology Practice blog, I’m tempted to organized one here in Saskatoon – who’s with me? Thoughts? Accolades? (Constructive) Criticism? Ideas for future posts? Please share!